The application of horizontal drilling combined with multi-staged hydraulic fracturing has resulted in a drilling boom for unconventional gas and oil across the United States. This technology has stimulated drilling activity and production in the Appalachian basin for Devonian shales (most notably the Marcellus, but also the Geneseo/Burket and Rhinestreet shales), as well as the Upper Ordovician black shale interval, which includes the Utica Shale, Point Pleasant Formation, undifferentiated Lexington Limestone (=upper Trenton Formation), and Logana Member (Figure 2-1). Preliminary production data and resource assessments of the Upper Ordovician black shale interval in the region has generated much optimism and drilling activity for this rapidly growing unconventional oil and gas play. Initial daily production rates and Estimated Ultimate Recoveries (EURs) in this report were obtained from company presentations. Sources of permitting and drilling activity included PAGS, WVGES and the Ohio Division of Oil and Gas Resources Management (DOGRM). Production data for Ohio also were obtained from DOGRM (Appendix 2-A (PDF, 470 KB)). All numbers in the following sections related to well activity and production are current as of May 1, 2014. Figure 2-1. 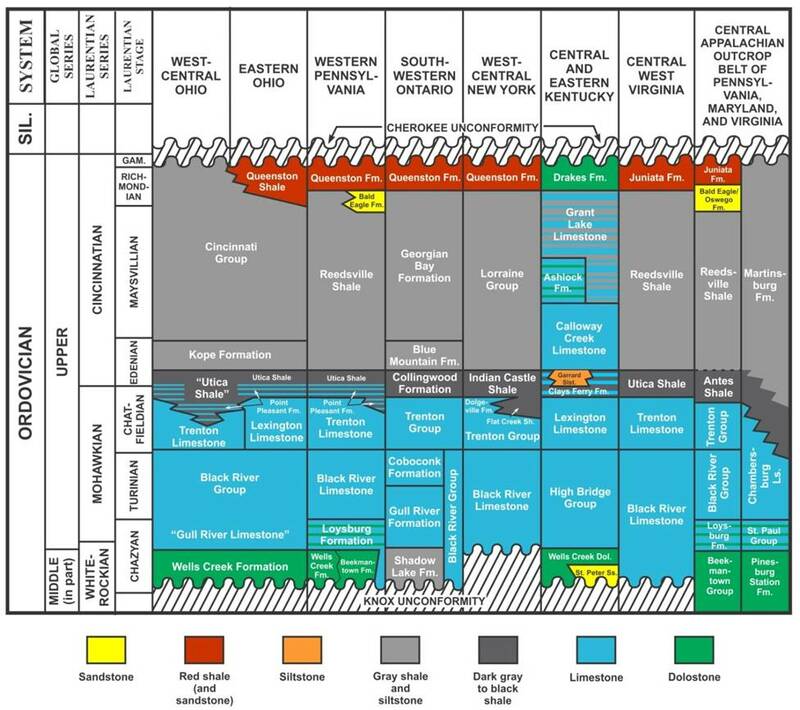 Regional correlation chart of Upper Ordovician strata for the Utica Shale Play Book Study. Approximately 1470 permits have been issued to drill horizontal wells to the Upper Ordovician Utica/Point Pleasant horizon, mainly in Ohio, but with approximately 245 in western Pennsylvania and 11 in the northern panhandle counties of West Virginia (Figure 2-2). Although operators for 562 of these permitted wells reportedly have yet to begin drilling, approximately 466 wells are reported as completed or producing, and another 425 are currently reported as drilling or recently drilled. Only 15 wells have been reported as being plugged. Oil, condensate and natural gas liquids (NGLs) are driving production growth. As midstream operations (pipelines, fractionation and gas processing plants) continue to expand, additional drilled wells are being placed into production mode. Drilling has extended the Utica/Point Pleasant play from the core area in Carroll, Harrison and Columbiana counties, Ohio to Tioga County, Pennsylvania in the northeast; Washington County, Ohio in the south; Licking County, Ohio in the west; and Ashtabula County, Ohio in the north. The current trend in drilling reflects the subsurface structure of the reservoir – a north-south trend in Ohio, swinging to northeast-southwest to the north, and then to east-west in Pennsylvania. Thus far, drilling has been concentrated in the liquids-rich area of eastern Ohio, with no horizontal Utica/Point Pleasant wells drilled in either Kentucky or New York. Increased drilling and production in southern Ohio may eventually extend the play into northern Kentucky. Although horizontal drilling is permitted in New York, there is a moratorium on hydraulic fracturing jobs using more than 80,000 gallons of water. This, in conjunction with the fact that towns can now use zoning ordinances to individually ban drilling activity within their township limits, has restricted the completion of Utica shale gas wells in the state of New York. Chesapeake Energy is by far the biggest player in the trend, with Gulfport a distant second (Figure 2-3). Chesapeake has received permits to drill 683 wells (46% of all permits issued), of which 246 are producing or completed and only four have been plugged. Other companies in the play have been issued an additional 791 Utica/Point Pleasant permits, resulting in 220 producing or completed wells and only 15 dry holes; 377 reportedly have yet to be drilled, with the remaining 178 still being drilled or awaiting completion. Figure 2-2. Drilling activity associated with the Utica/Point Pleasant play in the Study area. Data supplied by the DOGRM, PAGS and WVGES. Figure 2-3. Utica/Point Pleasant well statistics by operator. As industry extended infrastructure, production increased. The 2013 production reported by Chesapeake was 2,078,570 barrels (bbl) oil and 57.7 billion cubic feet (Bcf) gas from 217 producing wells (Appendix 2-A). This is up from 418,538 bbl oil and 12.6 Bcf gas for 2011 and 2012 combined. EURs are in the 5 to 10 billion cubic feet equivalent (Bcfe) range in the wet gas area (Chesapeake presentation, 2013). Chesapeake has concentrated in the core area of Carroll, Harrison and Columbiana counties, but has drilled wells as far east as Beaver County, Pennsylvania, as far north as Geauga County, Ohio, as far south as Guernsey County, Ohio, and to the westernmost corner of Tuscarawas County, Ohio. Gulfport has procured 124 permits to drill, mainly in Harrison, Guernsey and Belmont counties, Ohio, and has 37 wells reported as producing. Their wells in the liquid-rich area have an average horizontal length of 7175 feet (ft), with 25 hydraulic fracturing (frac) stages, and an average initial production (IP) of 2,780 barrels of oil equivalent per day (boe/d) (Gulfport presentation, 2013). Oil, gas and NGLs comprise 33%, 37%, and 29% of this total, respectively. One well, the Shugert 1-12h (API#34013206570000), is in the dry gas window and tested 30.3 million cubic feet of gas per day (MMcfg/d) with no liquids. The 2013 production was up to 675,097 bbl oil and 19.2 Bcf gas from 39 wells, compared to 63,167 bbl oil and 767 million cubic feet (MMcf) gas from 2012. Gulfport has estimated EURs of 3.1 to 3.9 million barrels of oil equivalent (MMboe) for wet gas wells and 1.0 to 1.5 MMboe for condensate wells (Gulfport presentation, 2014). Gulfport has been examining completion methods to eliminate the 30-60 day resting period that commonly follows hydraulic fracturing. This process of resting wells before going into production allows the formation to absorb the frac fluids. Recent slickwater hydraulic fracture completions with no resting periods on the Wagner, Lyon and Clay wells have shown no noticeable decrease in productivity versus using gel and resting wells. Gulfport postulates that the residue left behind from the gel may be closing off the micropores and inhibiting hydrocarbon flow. Slickwater treatment may eliminate the need for the resting period, which could put wells into production up to 60 days earlier. Antero has 77 permits to drill Utica/Point Pleasant horizontal wells in Monroe and Noble counties, Ohio. All but 20 have been drilled, with 19 producers, 36 drilled or drilling and two dry holes reported to date. Based on IP data, seven of their producing wells are among the top 10 producing wells in Ohio, averaging 5632 boe/d (Antero press release, 2013). The Yontz 1H (API#34111243620000) had an initial rate of 8879 boe/d on a 24-hour test, making it the highest IP in the region. All of Antero’s wells have produced gas, condensate, and NGLs: 57% of the production is liquids. The 2013 production was 215,627 bbl oil and 10 Bcf gas from 19 wells. This was significantly up from the 2012 production of 25,522 bbl oil and 37.7 MMcf gas. Hess has 63 permitted wells concentrated in the southeastern Ohio counties of Harrison, Belmont, Guernsey and Noble. 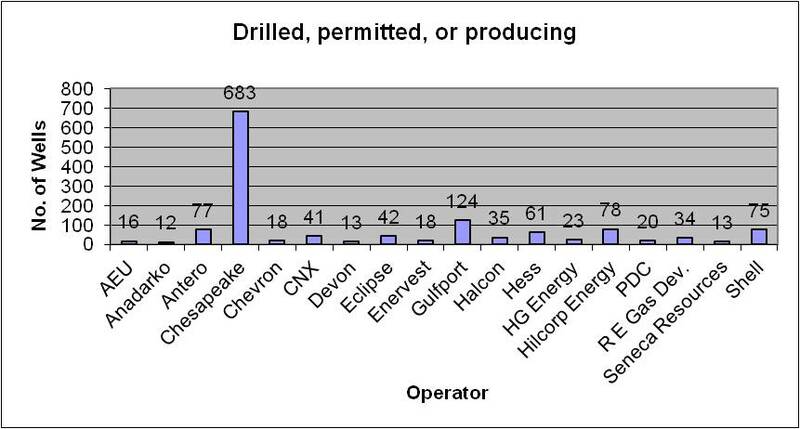 Of these, 19 are reported as producing, 17 are reported as drilled or drilling, and 27 have not been drilled. Initial test rates for nine wells range from 1211 boe/d with 65% liquids to 2519 boe/d with 52% liquids (Hess presentation, 2014). The 2013 production was 27,470 bbl oil and 2.9 Bcf gas for 13 wells. Only 560 bbl oil and 922.9 MMcf gas were produced in 2012. Rex Energy has been active in Carroll, Noble and Guernsey counties, Ohio, and Lawrence and Butler counties, Pennsylvania, with a total of 37 permitted wells. Of these, 15 are reported as completed or producing and nine are drilled or drilling. The Carroll County wells average a five-day sales rate of 1479 boe/d with 71% liquids (Rex Energy presentation, 2014). The wells in Guernsey and Noble counties have a five-day average sales rate of 1886 boe/d with 60% liquids. The 2013 production was 180,308 bbl oil and 4.1 Bcf gas for 12 wells, compared to only 12,879 bbl oil and 159 MMcf gas for 2012. Shell Appalachia has concentrated their efforts in the dry gas area in Pennsylvania – from Lawrence County eastward to Tioga County – and has permitted 75 Utica/Point Pleasant horizontal wells. Of these, 18 are reported as completed, two are drilled or drilling, and 55 are not drilled. There are no annual production data available for these wells. IP data are available for five wells and range from 1.4 to 5.3 MMcf gas. Magnum Hunter has called the Utica/Point Pleasant potentially the best shale play in the continental United States, and sold their acreage in the Eagle Ford play to concentrate specifically on the Utica/Point Pleasant play. They have nine permitted wells, of which two are producing or completed, two are drilled or drilling, one is plugged and four are not drilled. They drilled the first horizontal well in Washington County, Ohio, in April 2013 on the Farley pad, designed to accommodate 10 horizontal wells. Their Stalder pad, in Monroe County, has been designed for 18 horizontal wells, 10 for the Marcellus Shale and eight targeting the deeper Utica/Point Pleasant interval. The first well drilled on the Stalder pad (API#34111243850100) tested at a peak rate of 32.5 MMcfg/d (Magnum Hunter presentation, 2014). For 2013, Magnum Hunter had produced 5,162 bbl oil for four wells. Enervest has permitted 18 wells in Guernsey, Tuscarawas, Carroll, Stark and Jefferson counties in eastern Ohio. Of these, three are producing or completed, one is drilled and 14 are not drilled. The Frank 2-H well (API#34151257350000) in Stark County reported initial rates of 870 boe/d (1.2 MMcfg/d, 360 Mbbl/d oil, and 312 Mbbl/d NGLs). The Cairns 5H well (API#34019220930000) in Carroll County had an IP of 1690 boe/d (2.2 MMcfg/d, 729 Mbbl/d oil, and 587 Mbbl/d NGLs). Cumulative production for 2012 was 32,546 bbl oil and 160 MMcf gas. This oil production decreased to 31,835 bbl oil and gas production increased to 290.8 MMcf gas for 2013. CNX (Consol Energy) has permitted 41 Utica/Point Pleasant wells in seven counties in eastern Ohio. They have 13 wells reported as completed or producing, 17 wells as drilled or drilling, and 11 not drilled. Their exploration strategy has been to target four overlapping stacked shale plays within their acreage position covering portions of eastern Ohio, southwestern Pennsylvania and northern West Virginia. These include the Ordovician-age Utica/Point Pleasant interval, and the Devonian-age Marcellus, Geneseo/Burket and Rhinestreet shales. The Monroe County, Ohio, area has special appeal because of the potential dual pay in Marcellus at approximately 5700 ft and the deeper Utica/Point Pleasant at projected depths of approximately 10,200 ft. Cumulative production for CNX’s wells was 10,015 bbl oil and 9.9 MMcf gas in 2012. The cumulative production for 2013 was 14,163 bbl oil and 412.6 MMcf gas. 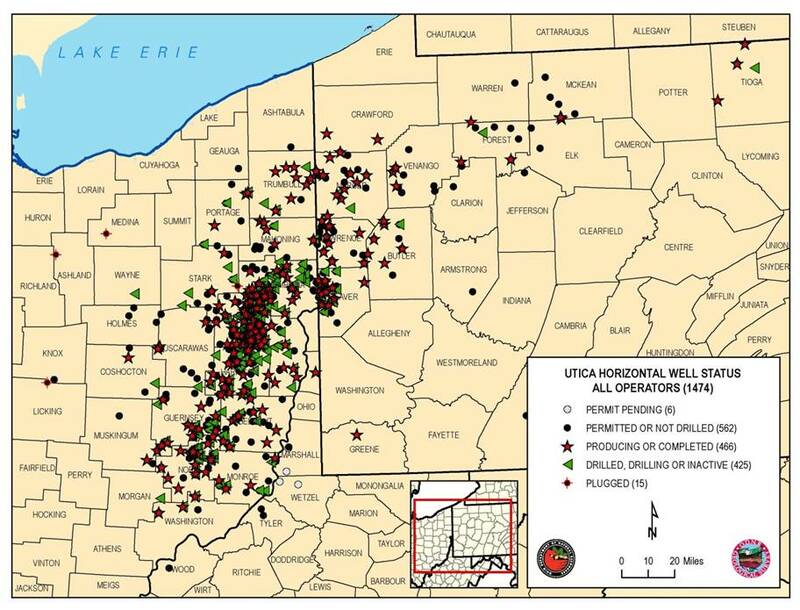 PDC Energy has permitted 20 wells in the Utica/Point Pleasant play in southeastern Ohio. They have 11 completed or producing wells, eight drilled and one not drilled. Their activity is focused in Guernsey, Washington and Morgan counties along the southern end of the play area. Significant producing wells in Guernsey County include the Onega-Commissioners 14-25 H (API#34059242110100), which had an IP of 1796 boe/d (79% liquids); the Stiers 3-well pad (API#s 34059242420000, 34059242430000 and 34059242440000), which had a combined initial production of 1268 Boe/d (79% liquids); and the Detweiler #42-3H (API#34059242920000) with 2197 boe/d (75% liquids) (PDC presentation, 2014). To the south in Washington County, the Garvin 1-H well (API#34167297210100) had an IP of 1530 boe/d (54% liquids). PDC reported cumulative production of 2120 bbl oil and 10.6 MMcf gas in 2012. The cumulative production for 2013 increased to 204,524 bbl oil and 982.6 MMcf gas. PDC has noted that flowback management of Utica/Point Pleasant wells is critical to the success of this unconventional resource play (PDC presentation, 2014). Preliminary data indicate that applying back pressure during initial flowback can significantly increase reserves and economics of Utica/Point Pleasant wells. Their initial performance results demonstrated longer-term productivity and a lower decline rate in wells simply by decreasing the choke size. Other companies who have drilled or are actively leasing and permitting Utica/Point Pleasant wells in the basin include Anadarko, Atlas Noble, American Energy, BP America, Carrizo, Chevron, Devon Energy, Eclipse, EQT, Halcon, HG Energy, Hilcorp Energy and XTO Energy, Inc. (XTO). Of particular note is American Energy, a new player that has raised nearly $3 billion to lease and drill Utica/Point Pleasant wells in eastern Ohio. Recent lease acquisitions by American Energy include 24,000 acres (ac) acquired from Shell, 74,000 ac from Hess and 30,000 ac from XTO. They have acquired about 260,000 ac in the play area and announced that they plan to drill 1600 wells during the next decade. Annual and quarterly production data reported to DOGRM have shown a marked increase over the past three years (Table 2-1). In 2011, the cumulative annual production was approximately 46,000 bbl oil and 2.5 Bcf gas from nine producing wells, which, incidentally, represented only 1% of the total oil production and 3.5% of the gas produced in Ohio. In 2012, 87 Utica/Point Pleasant wells yielded approximately 635,000 Bbl oil and 12.8 Bcf gas, which represented 12% of the total oil and 16% of the total gas produced in the state. 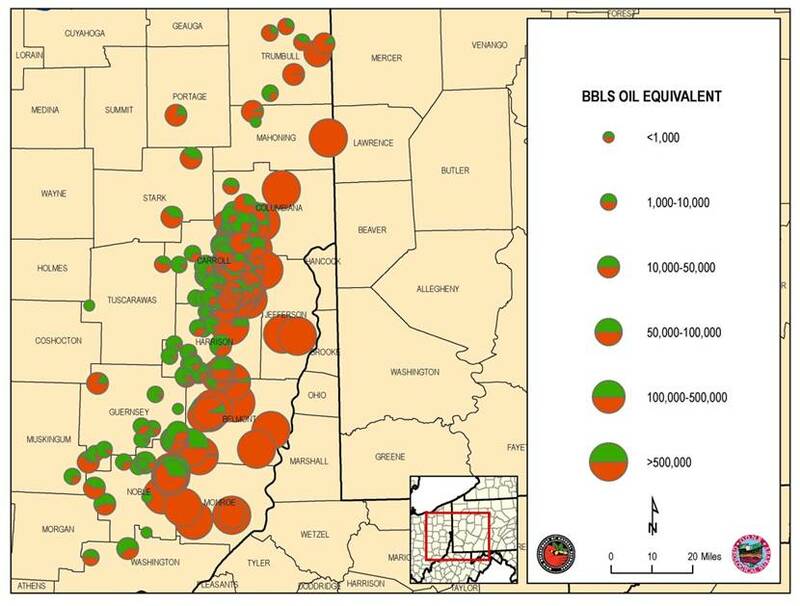 A significant increase was observed in 2013, with just over 3.6 MMbbl oil and 100 Bcf gas produced from 352 wells. These volumes represent 45% of the total oil and 58% of the total gas produced in Ohio. The total reported cumulative production for the Utica/Point Pleasant from 2011 through 2013 in Ohio was approximately 4.3 MMbbl oil and 115.3 Bcf gas. Production numbers are expected to continue increasing in the upcoming years as mid-stream operations expand outward, infrastructure continues to be developed and additional drilling continues. A bubble map of cumulative production per well was constructed using third and fourth quarter 2013 production data (Figure 2-4). Gas production was converted to boe and added to the barrels of oil produced to determine cumulative production per well in barrels of oil equivalent (boe). A conversion factor of 6000 standard cubic feet gas (sfcg) to 1 bbl oil was used for this purpose. Approximately 15.5 million boe (2,771,784 bbl oil and 76.7 Bcf gas) were produced during the third and fourth quarters of 2013 (Figure 2-4, Appendix 2-A). A northeast-southwest trend of higher production is seen extending through Columbiana, Carroll, Harrison, Belmont, Noble and Monroe counties. The ten best wells produced more than 200,000 boe during this time. All 10 wells were operated by Gulfport Energy or Antero Resources in Monroe and Belmont counties. Higher pressures in this region are thought to be a factor in producing these higher rates. The best producing well during the third and fourth quarter of 2013 was the Gulfport 1-14H Stutzman well (API#34013206650100) in Belmont County, which produced 345,514 boe. Figure 2-4. Bubble map of combined third and fourth quarter 2013 production data (boe) in Ohio. Gas has been converted to boe using 1 barrel of oil equals 6000 scfg. Results have been less encouraging to the north and west of these areas. Trumbull County has shown lower producing rates (Figure 2-4, Appendix 2-A). These lower production rates are consistent with recent announcements by BP and Halcon that they are terminating Utica drilling in Trumbull County. Thus far, drilling farther west in the updip portion of the oil window also has produced less encouraging results, as evidenced by nonproductive Devon wells drilled in Coshocton, Knox, Medina, Wayne, and Ashland counties. Clearly, the economic producing extents of this play are still being developed. 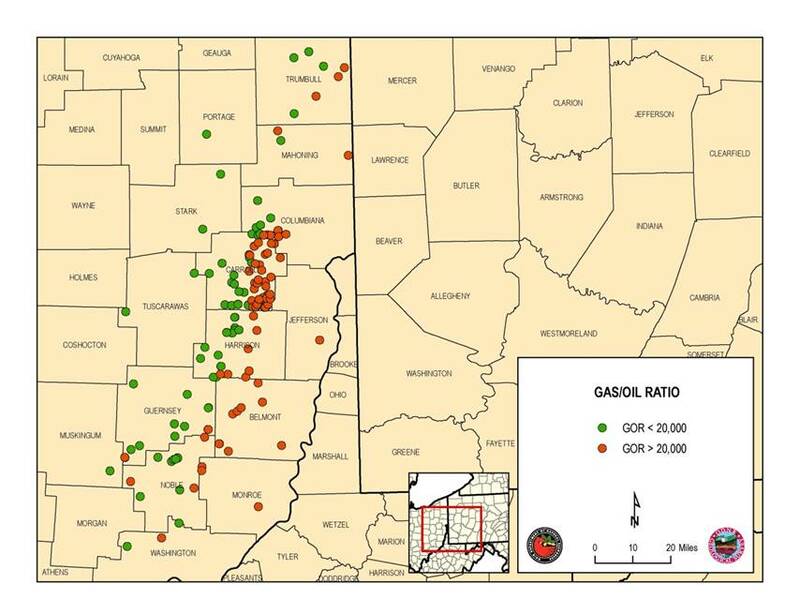 A gas-to-oil ratio (GOR) map was constructed using the combined third and fourth quarter 2013 production data for 359 wells in Ohio (Figure 2-5). A northeast-southwest trend separating the oil window from the gas window is visible using a GOR of 20,000 standard cubic feet gas per barrel oil (scfg/bo). A GOR map used in conjunction with bitumen reflectance and RockEval mapping from this Study may help to better refine the oil and gas window in this unconventional shale play. Table 2-1. Summary of Utica/Point Pleasant production compared to conventional production for 2011 through 2013 in Ohio. Note: Gas includes NGLs. Figure 2-5. GOR map of Ohio using a cutoff of 20,000 scfg/bo. A delineation of the gas to oil window is evident trending northeast-southwest through eastern Ohio.